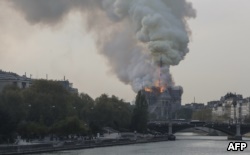 French media reported that fire officials said the blaze could be “potentially linked” to renovation work being done at the building. French President Emmanuel Macron tweeted, “Like all our compatriots, I am sad this evening to see this part of all of us burn.” He canceled a planned policy address to the nation and visited the scene of the blaze. Witnesses said firetrucks sped to the area after the fire broke out shortly before 7 p.m. local time. 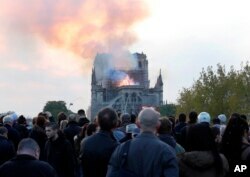 Hundreds of people gathered on Paris’ bridges over the Seine River to watch the scene.